Happy 21st birthday to meeeee. Anyways, so recently I've been saving M.A.C face charts to my computer, I never used to bother with these but they give me inspiration when I have no idea what I want to do. 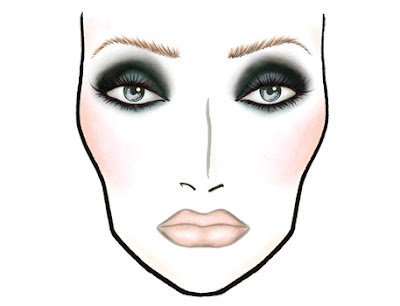 So today I decided to go with the Feline face chart from the new Love Lace collection. As I'm pretty sure I'm not getting anything from this, I used what I had. Apologies for the photos, I seem to have lost ability to take good ones today! It looks pretty much identical to the face chart and I'm glad I executed this so well. 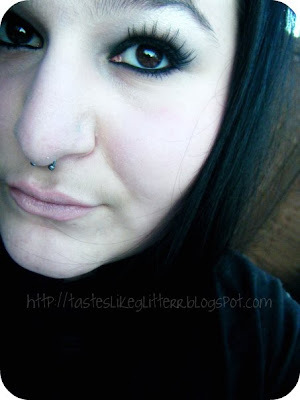 M.A.C Eyeshadow - Carbon (All over lid, on top of Blackground and to set Feline). M.A.C Paint Pot - Blackground (All over lid). M.A.C Mineralize Eye Shadow Duo - Family Silver (The light colour used as highlight, to blend out Blackground and over Blackground on first half of lid). (LE). M.A.C Eye Kohl - Feline (Water line, lower lashline). (LE). M.A.C False Lashes - 8. M.A.C Lipstick - Close To Real. (LE).